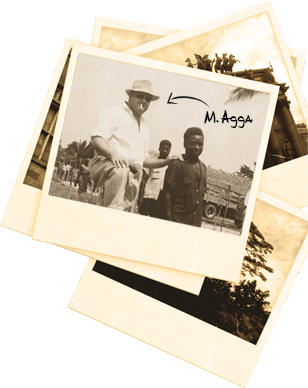 In 1947, Mr. George Agathiadis, creator of Agga, traveled to Sangmelima. Five hundred kilometers (500 km) from the plantations of Douala, it is the economic capital of Cameroon in Western Africa. His eldest son, Philippe, slowly discovered the mechanisms of the trade, as well as the severity of the Cameroon’s volcanic lands. He studied the different approaches to plantations and harvesting. In the African bush, and on behalf of the multinational Europeans, Philippe set up many coffee processing factories. These factories continue to prosper today. Specialized in the coffee trade, Philippe then began his journey to work in more than 25 coffee producing countries, which include Brazil, Columbia, Kenya, Peru, Rwanda and Zaire. In 1987, Philippe was appointed Arbiter of quality coffee by the Chambre Arbitrale des Cafes de Paris. This is a world-wide title recognized by all coffee producing countries. With this recognition, Philippe Agathiadis was proclaimed as a First-Rate Connoisseur. In 1988, Café Agga was introduced to Quebec.